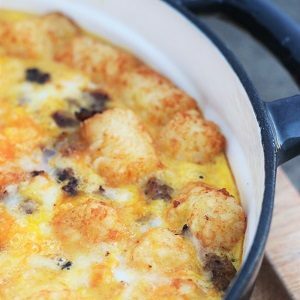 December 20, 2016 0 comments on "Tater Tot Breakfast Casserole"
I have been making tater tot casserole for my family for dinner as long as I can remember. I don’t know when the recipe gained popularity, but it was probably around the time tater tots were invented! I know the recipe has been around for a long time. I recently stumbled across a recipe for a breakfast variation of the recipe, and it’s pretty great! It tastes similar to a traditional hashbrown breakfast casserole, with more of the flavor of tater tots than hashbrowns. Note: This recipe makes 5 servings. You can easily double this recipe to make 10 servings if you are serving a crowd. Brown sausage in a large skillet, drain fat. 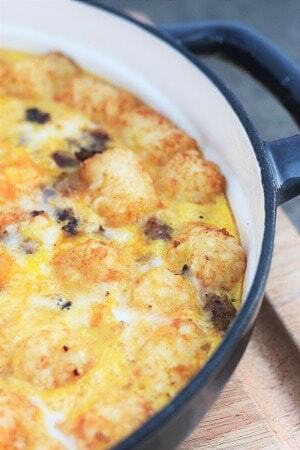 Combine sausage, tater tots, and cheese in a large bowl. Pour into a large casserole dish. In a separate bowl, whisk together eggs, milk, and seasonings. Pour over tater tot mixture. This recipe can easily be prepared ahead of time and refrigerated until ready to bake.